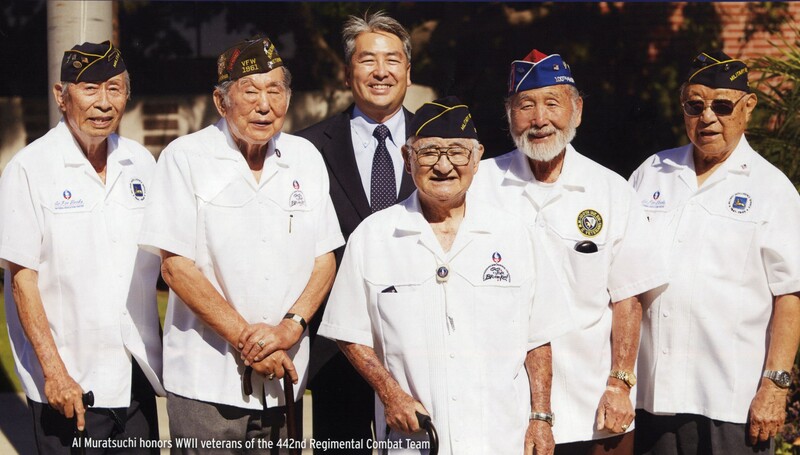 Al Muratsuchi in a photo taken in 2014 with veterans (from left) Victor Abe, James Ogawa, Ralph Kaneshiro, Mas Takahashi and Ken Akune. Nisei veterans who appear in a campaign flyer in support of Al Muratsuchi’s Assembly campaign have complained about the use of their photo and its implied endorsement. The photo, taken in front of Gardena City Hall in 2014, first appeared in campaign literature during Muratsuchi’s unsuccessful re-election bid. The photo shows Muratsuchi with veterans Victor Abe, James Ogawa, Ralph Kaneshiro, Mas Takahashi and Ken Akune. Abe and Takahashi have passed away since the photo was taken. Photo release forms provided by Muratsuchi’s campaign indicate that the five veterans signed release waivers on Sept. 5, 2014. However, the permission form states that it was for the 2014 campaign. “We have respectfully asked Al Muratsuchi in August 2016 to refrain from any use of our photos depicting support for his campaign and are disappointed that the use has continued despite our wishes to the contrary,” the families state. “It was used by a third party conducting what is called an ‘independent expenditure campaign.’ That means they conduct the campaign without the coordination or knowledge of my campaign. I cannot legally communicate with the committee that did this, although I have publicly asked they refrain from using these photos, as I have refrained from using them in my campaign,” Muratsuchi said. The race between Muratsuchi and Republican incumbent David Hadley has received considerable attention with an estimated $2.6 million in spending on campaign advertising on both sides. The Los Angeles Times reported that the Spirit of Democracy California, backed by Republican mega-donor Charles Munger Jr., has spent $1.4 million in negative ads against Muratsuchi. The Times reported that allegations filed by Muratsuchi claiming illegal coordination between the Hadley campaign and the Spirit of Democracy are currently being investigated by the California Fair Political Practices Commission. Al says he has nothing but respect for veterans but if he truly believed he did nothing wrong, he would have been proud to release these photos himself. It was only after he was told in August to not use their photos, that he released his photos to the Indian casino to run as an independent expenditure campaign which gave him an out and is a violation of the law. Contrary to his statement, he did use their photos without consent which is why the families are justifiably outraged.